John Kaminski, his Curtiss pusher, and a young admirer. About the incident in this photograph, a local Ohio newspaper wrote: "Dances, pretty dresses, and all of the things in which a normal 17-year-old girl is expected to take an interest have lost all charm for Mary Stanley of Silver Lake, since Dr. Silverston brought his aviators there. Direction and force of air currents, the merits of the fight between Curtiss and the Wright Brothers, aviation records, the advantages and disadvantages of the Bleriot monoplane, and kindred subjects are now her topics of conversation. When the machines, high in the air, dart over the field the girl is there, watching the flyers with dancing eyes and flushed cheeks." 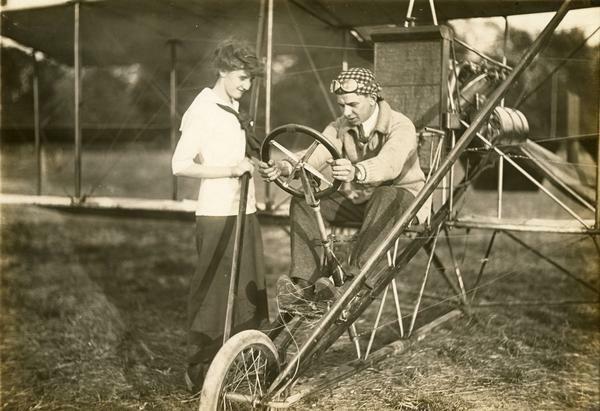 Here Kaminski is demonstrating to Mary Stanley something of the way in which a Curtiss pusher operated. The wheel was used to turn the rudder and the throttle was operated with the feet. To move the ailerons between the wings, the pilot pushed his shoulder against the controls.